This beautiful, durable wooden rosary from Brazil features resin-coated beads depicting the Sacred Heart of Jesus. 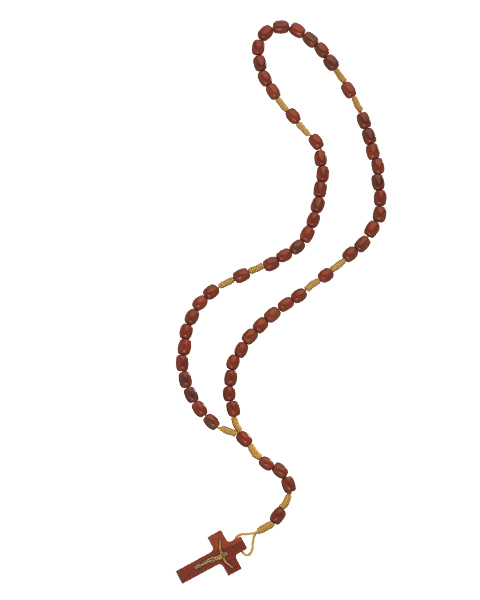 The polished cherry wood beads and thick cord of this rosary make it incredibly durable. Supplies are limited! This medium to large Oval Wooden Scapular was made in Brazil by expert local craftsmen. 1-1/16" Sterling Silver Portrayal of St. Matthew with an Angel Writing his Gospel Book. He is the Patron Saint of Accountants, Bookkeepers, Bankers. Would you like it engraved? We can engrave the back of the medal with a special message for an extra fee. See the product details box on this page to specify engraving. A 24" Rhodium Plated Curb Chain is Included with a Deluxe Velour Gift Box. This Sterling Silver Oval Shaped St. Matthew Medal is made in the USA. 7/8" Sterling Silver Portrayal of St. William with a Book and Cross. He is the Patron Saint of Irpina, Italy. This Sterling Silver Oval Shaped St. William Medal is made in the USA. Proves that today's Marian doctrine is firmly rooted in the early Church's teachings and refutes the Protestant claim that Catholics invented devotion to Mary. Fresh, beautiful insights--typical of Cardinal Newman. The famous persevering mother whose prayers, patience and good example at last obtained the conversion of her wayward son - the great St. Augustine - as well as her pagan husband and her mother-in-law. Includes her childhood, difficult marriage, anguish over Augustine, constancy and - in the end - her joy at his conversion. A magnificent story of prayer finally answered! Our The Holy Rosary Book Mysteries 2 is one of our most popular Catholic products. Made of high-quality materials and yet affordable! This item is also available at discounted bulk prices for orders of multiple quantities. Simply search our site with the product number 40745.